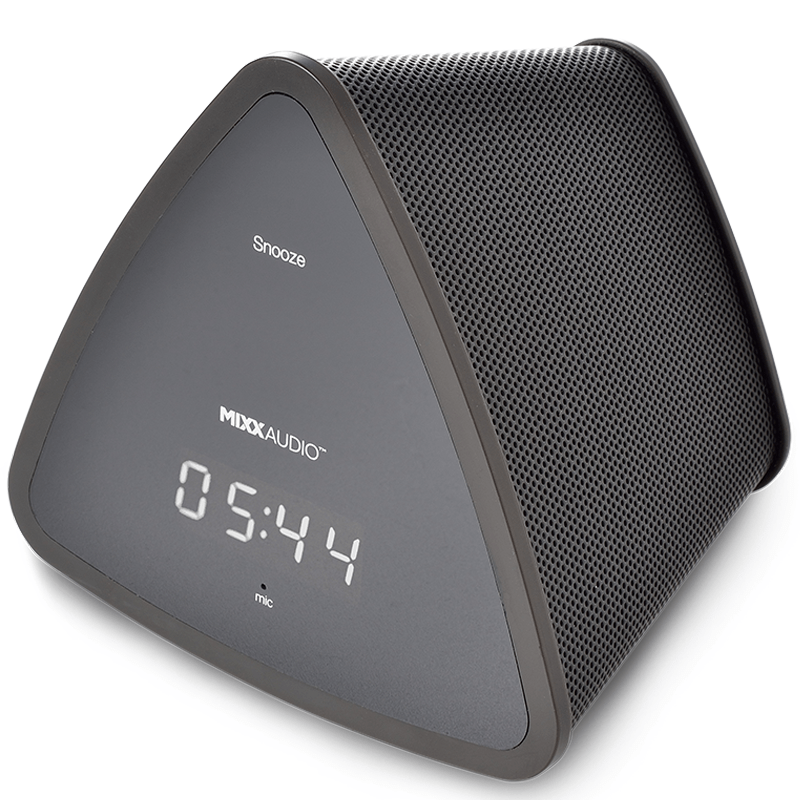 UK audio specialists Mixx Audio today announces the launch of its S3 Wireless Bluetooth Speaker with built in digital alarm clock. The Mixx S3 offers great sound and functionality; whether as a bedside wireless speaker, a digital clock with alarm or a phone charger, as well as being portable enough to use in all areas of your home. All this, in one in stylish, lightweight device. The Mixx S3 is the perfect solution for anyone who is looking for a speaker that is small in size, sounds great and is incredibly easy to use. Available in pink and black, with anti-slip base to reduce surface vibration and dual speaker design for bass and detail, the S3 is packed full of extra features. Heavy sleepers need not despair as its two alarm settings will ensure you are up in time for your first meeting, your lecture or to get the kids to school before the bell rings. For those reluctant to emerge from under the duvet, there is also the comfort of a touch to snooze button for those extra few minutes of rest! Whilst being used as an alarm clock, the S3 can power up your phone with its built in charging port so you can wake up gently with your phone fully charged, ready to start the day with a strong coffee and your favourite tunes pumping. The built in microphone allows for hands-free calls so ideal for multi-tasking and calls on the go. The S3 uses Bluetooth 4.0, allowing it to easily connect to any audio device such as smartphones, laptops or tablets within 30 feet/10 metres and has a rechargeable battery with up to 7 hours music playback. There is also the option of an additional back up battery option to retain clock time and alarm. So, if you are looking for one device which wakes you up, charges your phone, plays your music, allows for hands free calling and is light and portable, the Mixx S3 is for you. Style, versatility and functionality for anyone, anywhere. For years gamepads for PCs were not a thing, now it seems, they have caught up with and even overtake the complex stylings of the console competition. Some prefer them, so, therefore, there is a market. Microsoft and Playstation are forever bettering their input methods from generation to generation and sometimes in between, however with the PC gamers can open a whole next level of customisation and Speedlink knew this, delivering the Quinox Pro. This is a comfortable gamepad, with reconfiguration to the hilt and a price that doesn’t upset. Looking around the device the front sees most of the action. A D-pad with independent buttons might be one of the more controversial design elements. The non-replaceable thumb sticks are identical and possess a decent amount of travel. Four large action buttons sit to the right with illumination. A Back and Start button sit in the centre with a large Xbox style guide button. A small OLED screen is positioned in the centre bottom region. On the back, there are 4 accessible paddles and two slider switches, one for switching vibration on and off, the other switches from Xinput to Directinput, cunningly titled X and D. Crucially, the Quinox supports both Directinput, for mouse input signals and Xinput, mimicking the Xbox configuration. On the bottom are two controller dials which, when pressed or flicked left and right, navigate a menu on the OLED screen. These dials are separated into left and right and adhere to the left of right thumbstick for the most part. flicking dial brings up the. The left dial configures and selects the Marco modes, remapping buttons to the bumper buttons and paddles on the top and back. Flicking the right dial and using the D-pad turn the LEDs on and off. Time is required to get the most out of these buttons. Initially, they are quite confusing however, the benefits are obvious once you successfully bind a button to a complicated button combination. The top sees two analogue triggers and two bumper buttons. In addition, there are two programmable buttons. These require quite a bit of extra travel and should not be relied on for frequent usage. The Quinox connects by a 2.4m braided microUSB to USB cable that is detachable from the controller. This is a good length to please most folks, of course from some I won’t be long enough however it is replaceable with a longer MicroUSB cable. One warning is, do not pull this out unless you have to, plugging the cable back into the controller is not easy and quite frustrating. The braided cable is good quality, tough yet soft to the touch. In the hand, the Quinox Pro is a comfortable gamepad. 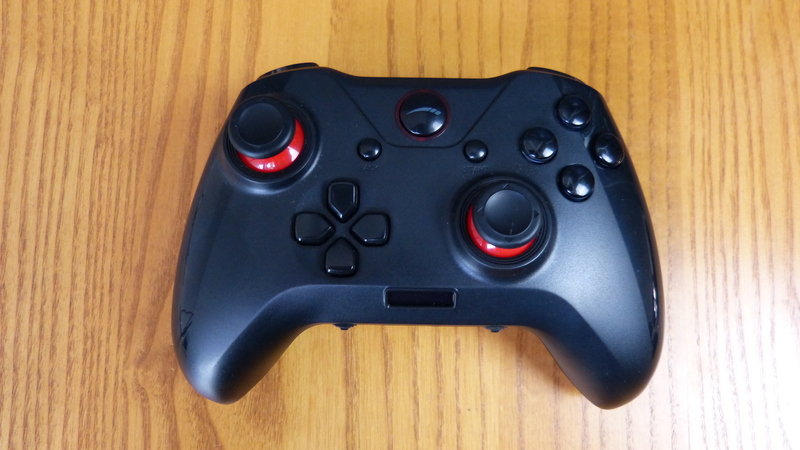 Very similar in feel to the Xbox One controller if a little thinner. The rear paddles might be a little uncomfortable for the larger hands however they might just take some getting used to. Gaming feels quite natural however as an old school gamer I found it a little daunting to have so many buttons, something the youth or seasoned gamer might not experience. The build quality is perfectly acceptable with strong plastic and durable buttons that feel they last a long time and take quite a pounding.There are no details or design flourishes to speak of and this is quite refreshing where an over saturated market has some great controllers with nonsense etched into the body. Speedlink have things, simple and black but not without and an eye-catching dash of red. Some folks will use a Gamepad for every game, personally I am not a fan of gamepads in general, however, I do concede they have their merit when pairing with the right game. Project Car has some easy benefit from the analogue sticks, platforming games perform well and the controller wipes the floor with any keyboard and mouse combo. However, it cannot measure up to a first person shoot or strategy game that demand keyboard and mouse. The Speedlink Quinox Pro USB has everything you would want from a gamepad. There is little to fault and a price tag that makes it worth considering. For more information, check out the Speedlink site here. 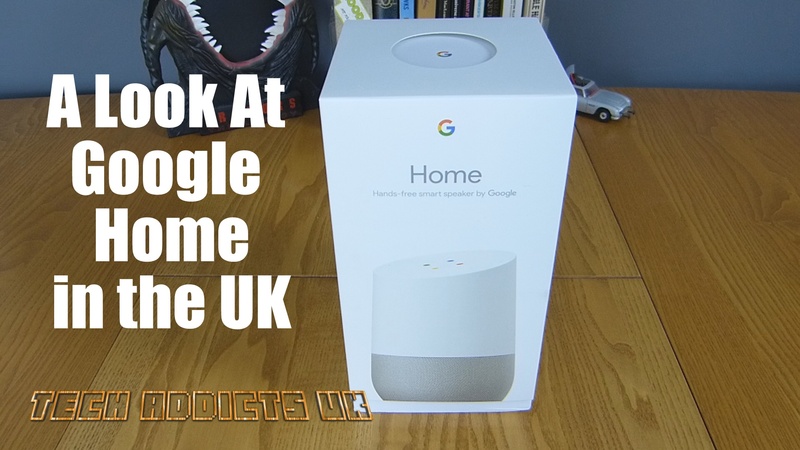 It might have been released stateside 6 months ago, Google Home has now been released in the UK with some optimisation for the UK consumer. This is a hands-free smart speaker powered by the Google Assistant. Ask it questions. Tell it to do things. It’s your assistant, triggered by saying, “Ok Google”. Here we take a look at the basic setup and first operation before a full review. Thanks to Maplin for sending over a review sample. You can pick one up from here. The world of the laptop and two-in-one device is a crowded one at the moment and Windows 10 has really excelled at providing an operating system that is both lightweight and features packed for the budget to mid-range device to run quite well. 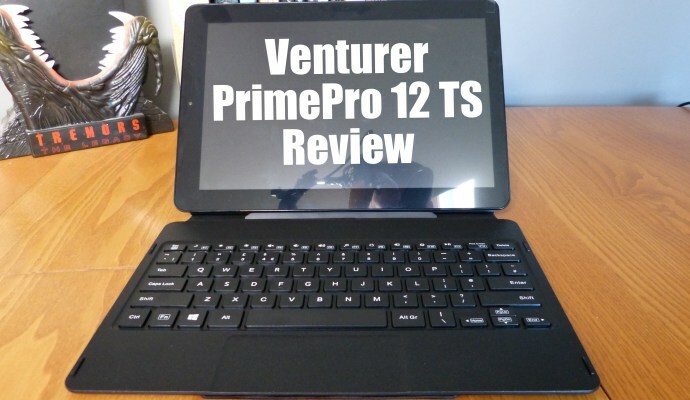 Venturer look to be making waves and this environment and whilst their latest device, the PrimePro 12 TS, is not without its flaws, the sum of the parts is commendable. The Prime Pro 12 TS easily feels like they have learnt from the mistakes of previous models. It looks a lot better, it feels more premium and most importantly it runs smoothly. A 12-inch screen with a resolution of 1920 x 1200 pixels proves to be just perfect for day to day interactions. Of course, this is a touchscreen device and therefore prone to large, oily fingerprints, something that is very difficult to avoid. One thing I will say about the screen and whilst it’s hardly a negative a small quirk is that the display is off-centre due to the camera on the left-hand side. Once noticed it’s impossible not to notice again. Everything is fine when running this in portrait mode, however, adopting landscape to plug it into the keyboard it just feels a little Asymmetric. The keyboard bundled with the unit is a great feature and one that will attract many a business person who isn’t interested in the high price of the Surface line. By comparison with the previous Venturer model we looked at, the keys are greatly improved, there is decent spacing and enough travel so that you know that you press the button once you’ve pressed it. Early usage finds that the keyboard dock was a little unresponsive and this annoyed me to some degree. I felt I needed to push a little harder for the keyboard to respond, building up speed saw letters being dropped however once I got the knack I was able to build up speed whilst also pushing the buttons to a degree that I was sure of that the keyboard had received the signal. Over time this went away and now it’s very simple to type without issue. Perhaps the keys had a “bedding in” period of sorts. The magnetic connection between the keyboard and the screen is very strong, I never doubted it for one moment which is commendable. When connecting the screen to the keyboard it always worked the first time, there was no fiddling around trying to find the connection and with a solid “thunk” you knew you were there. The touchpad is great. Measuring almost 5 inches by 2 inches, there is plenty of travel in any direction. With no moving parts and stylishly cut into the keyboard’s base, there is little that can go wrong with it. One thing that can be said about the unit as a whole is that it’s not the lightest, in fact, the whole thing bundled together is quite heavy. Weighing in at 1500 grammes, it’s on the heavier side, but thrown it in the bag and it’s not that noticeable. Folding the device up and putting it away is initially quite tricky but after using it for a few days you realise just how simple that actually is and becomes second nature. Once bundled up everything feels secure and protected save for the exposed microSD card, the one big problem on the exterior of the device. This popped out once on the train and landed on the table. Whilst it only happened once, it was one time too many. I noticed it and felt it as I tapped it with one of my knuckles however on a busy train or leaving a flight this might be less than ideal. Perhaps a little piece of tape might hold things together a little better but who wants that? Port-wise the Venturer Prime Pro has a lot to offer. Some my gripe there is only one USB, however, I never noticed the need for more. The mini HDMI is handy however I feel it’s a little redundant and was replaced by the micro HDMI and the micro USB was something I never found a use for. The addition of the rear camera is a peculiar one and the device could do without it. For most of the time, I forgot it was there and whilst it is only two megapixels I guess it might be handy for capturing a business card but it certainly isn’t going to record your holiday memories. With a fixed focus and strange zoom in appearance, the photos feel as if there should be a warning that objects may be closer than they appear. In the unboxing video, I was unsure of the volume switch, as to whether or not it was a handy placement. In usage it became invaluable. Easy to find and as it’s a button it was actually more responsive than other options like rollers. Windows 10 runs very well. Initially, I was highly concerned as upgrading to the latest version of Windows 10 took a ridiculous amount of time. After almost 24 hours I finally had the machine up to date. This concerned me as I figured things were quite slow when it came to the Intel atom 1.83 gigahertz processor inside, coupled with 4 gigabytes of RAM. Thankfully once updated the machine appeared to be pretty quick. I rarely noticed any slow down when opening multiple applications and even managed some light gaming with some older titles downloaded through GOG Galaxy. To boot the device from fully powered off to a usable state took roughly 20 seconds. When using the device it lasted for around 5 hours doing a little word processing and web development, nothing too intensive. The media playback on the screen worked well, movies look good and the full HD display impressed. The speaker was acceptable however as with most speakers there is always room for improvement. Viewing photographs, the colour representation was pleasantly more than adequate and at no stage did it appear washed out. The screen gets a solid thumbs up indoors. Outside, one a sunny day things were a little different. With the brightness up full, the screen’s glossy finish made things impossible to see, a real shame. The Venturer Prime Pro 12 TS is a very good alternative if you aren’t prepared to spend the money for the typically recommended Windows 10 experience. At £350 it is a little more than a budget laptop however you do get a more accessible experience having the choice to leave the keyboard behind and that might be worth that price difference. I have enjoyed my time with the Ventura prime pro12 TS. It’s an interesting form factor from a company daring to be a little different. The Prime Pro does turning heads and people have asked questions. I can nit pick, but there is nothing I can really complain about, it’s a strong package at a good price and worth considering if you’re looking for a portable Windows 10 two-in-one device. It might have been released stateside 6 months ago, Google Home has now bee released in the UK with some optimisation for the UK consumer. This is a hands-free smart speaker powered by the Google Assistant. Ask it questions. Tell it to do things. It’s your assistant, triggered by saying, “Ok Google”. Speedlink have sent over their latest Ultor Mechanical Gaming Keyboard and a keyboard that can be considered as a portable offering. Featuring Red switches the Ultro loses the numerical pad leaving the keyboard much shorter than other on the market and a lower price tag than some of the competitors. This mechanical keyboard has an impressive metallic red chassis buried under its keys. There are only small portions of the chassis peeking out in various places as Speedlink have cut down on any excess to make a keyboard truly too the point. The Chassis might have a plastic underside however that makes sense as it is rarely visible. The keys on the Ultor feature Red switches, also known as Kailh switches. Kailh switches may be a copy of Cherry MX (Red) however they have a good reputation in the gaming community and are not a cheap alternative or second best. that are almost indistinguishable from their Cherry MX (Red) counterparts. Some may take issue with the lack of additional keys, volume control and no USB or audio ports. There is a multitude of gaming keyboards on the market and it’s refreshing to have a mechanical keyboard in its purest form. There will be a market out there. Underneath, the keyboard features three rubber feet that keep the keyboard in one place when in use and two rear legs can be raised or lower depending on the angle required. These 10mm legs can be locked into position and only feature one locking position. The are not adjustable. Connecting the keyboard to the computer is a hard wearing braided cable. Oddly this connects off centre on the keyboard, however, I can’t imagine too many people finding fault with this, perhaps it was in the centre before a D’Pad was chopped off. The cable is 1.7m long and that feels generous. When activated the keys glow blue and leak light stylishly onto the red chassis and things look pretty good. Some might scoff that the keys should glow red to match the keyboard, however, the blue allows for a much clear visual especially when tapping away, late at night, much like I am doing now. The buttons are bright and eye catching and I am personally a fan of the blue on red. A nice mix from Speedlink. The WASD and cursor buttons glow white to differentiate themselves and it’s a nice touch. However, there is no option for the user to colour coordinate and this might both some. The default is good, but customisation is always better. Losing keys does not mean losing functions, additional functionality comes from the Fn button found to the right of the Space Bar. This alters the functionality of all of the F keys along the top of the keyboard alongside the Print Screen and Scrl Lock keys. F1 through to F4 adjusts the USB polling Rate. The Print Screen key turns the Ultor into Gaming mode, activating the Macro keys. Scrl Lock key adjusts of Brightness in a cycling mode and a Breathing Effect thrown in for fun. There are 11 different brightness levels (10% increments including off.) Under these buttons is a total of Six Macros keys described as M1 to M6 are configurable through the Speedlink software. In use I found the keys to be responsive and comfortable. The odd time I had to remind myself that this is a mechanical keyboard and it responds to the tiniest pressure and resting a finger on the button can accidentally register a hit. For typing, the keys don’t feel too crammed together, however, there isn’t much space between each for someone with large fingers like myself. If you think you might have encroached on a neighbouring key then you likely have as the keys are that sensitive. The Return button does have an odd quirk. Tapping the bottom right corner can cause a crunch, it will still register the stroke however it just feels a little unnatural. The Speedlink software is not lacking in any features however it doesn’t really go above and beyond either. We have three tabs, Main keys, Macros and Advanced. Along the bottom are five profile tabs, when selected each of these profiles will be configurable by the three tabs above. Under the Main Keys tab, you can remap keys for each profile and remapping is as simple as clicking on the key and reassigning the function in a pop-up menu. This is for key remapping only, not button combinations. The Macro tab is where you can reassign any of the six Macro keys. The Macro keys allow for simple keyboard commands or more complex commands such as Windows functions and key combination. The Advanced tab allows you to adjust various other settings on the keyboard such as USB Polling Rate, Windows Key Setting Key, Response Time and Light Intensity. Not entirely sure why these are summarised as Advanced and adjusting something like the brightness here adds an awkward delay in the outcome on the keyboard. You are better off using the Fn key. If I was to gripe about one thing, it would be the tray icon, it’s the same as other peripherals from Speedlink, if you own a Speedlink mouse you will have to guess or hover over to assess which tray icon you need to open to adjust any settings. 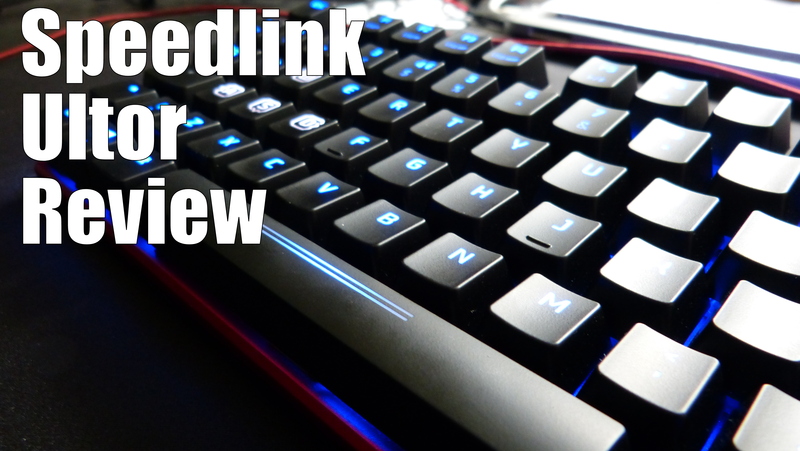 Overall, I like the Speedlink Ultro very much and it has become my main keyboard, at least for the time being. The compact design saves space and the red, metal chassis is a subtle eye-catcher. With the price tag of around £80, the Ultro is great value and a superb example of a gaming keyboard on a budget. This much quality at such a low price is hard to find. You can pick one up from Amazon here. 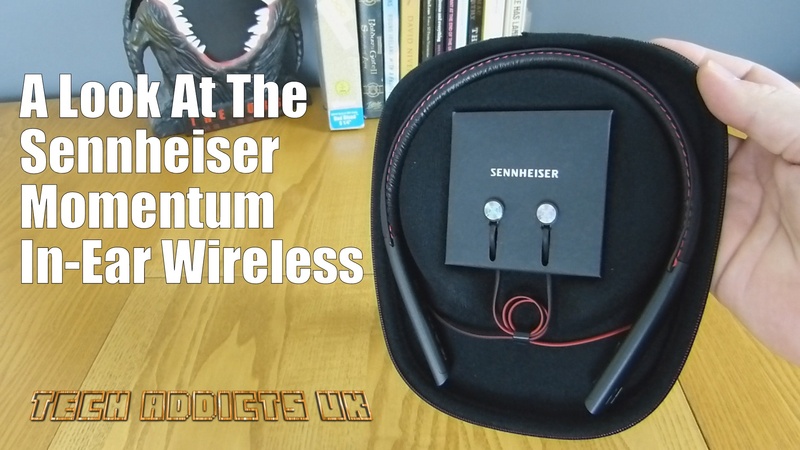 Sennheiser has sent over their good looking Momentum In-Ear Bluetooth headphones for evaluation. The new MOMENTUM In-Ear Wireless combines sleek design, immaculate sound performance and take-anywhere mobility. This premium neckband headset made of luxurious, high-quality materials, offers exceptional hi-fi wireless sound assured by Bluetooth 4.1 and Qualcomm® apt-X™. With NFC for simple one-touch pairing, an integrated microphone, and a ten-hour battery life, it is the perfect companion to mobile devices. You can grab them off Amazon for £169.99 here. Olixar has officially released their full line-up of premium affordable cases for the Samsung Galaxy S8 and S8 Plus, ranging from thin to tough cases. Many of their cases are already in stock and available from Mobile Fun and Amazon. Well known for their premium, innovative gadgets and accessories, which have been featured by the likes of Unbox Therapy, Olixar will have a complete selection of accessories available on release of the S8 and S8 Plus, including screen protectors and chargers. With the long awaited Galaxy flagships finally becoming available this month, many people will be looking for the perfect case to protect Samsung’s beautifully designed Infinity Display. Olixar will have a wide selection available to suit any need with all their tried and tested cases such as the ExoShield with its reinforced corners, the rugged ArmourDillo and the carbon fibre X-Duo cases. / The Olixar range of cases for the S8 and S8 Plus include many of their most popular cases such as the Ultra-Thin, ArmourDillo and Genuine Leather cases. There will also be some exciting newcomers in this line-up, such as the X-Trex Rugged Card Case. This tough case is the ultimate combination of protection and practicality in a sleek straightforward design. The X-Trex comes with a functional built-in stand that can be used in both landscape and portrait mode as well as a handy card slot with enough space to store two cards. 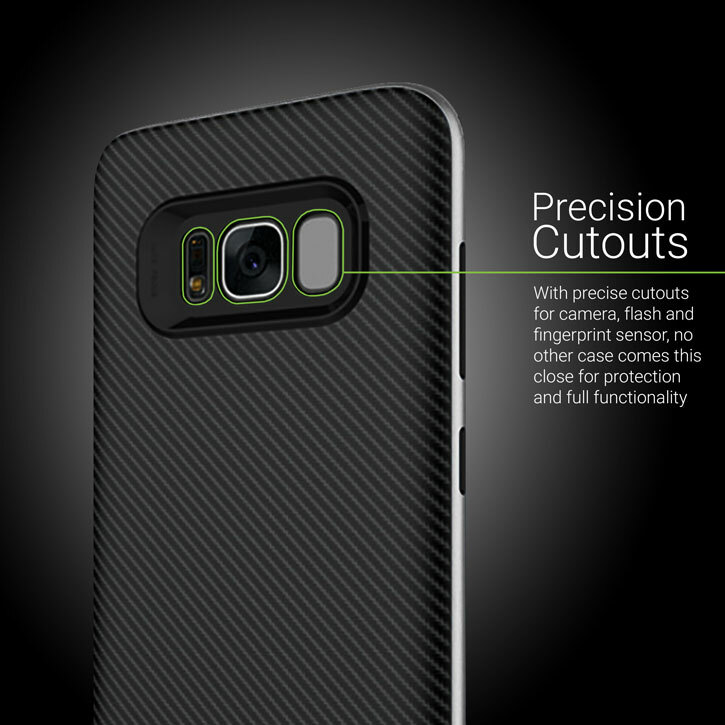 On top of that it features a robust multi-layered design to protect the S8 or S8 Plus against anything life throws at it. Two further additions come in the form of fashion cases: the X-Ring and X-Tome. The slim X-Ring offers stylish protection and has the added benefit of a practical finger loop on the back for extra grip that also doubles as a viewing stand. The X-Tome has a vintage, leather bound book design that benefits from two interior card slots and a document pocket to keep important possessions together when out and about. Olixar’s X-Trex, X-Ring and X-Tome cases can be pre-ordered now, the rest of the line-up is available for purchase from Mobile Fun and Amazon. More information on product availability can be found on Mobile Fun. 8848, China’s leading luxury phone company, presented its high-end smartphones for the first time in Europe at the well-known Baselword fair, taking place from 23 to 30 March in Switzerland. 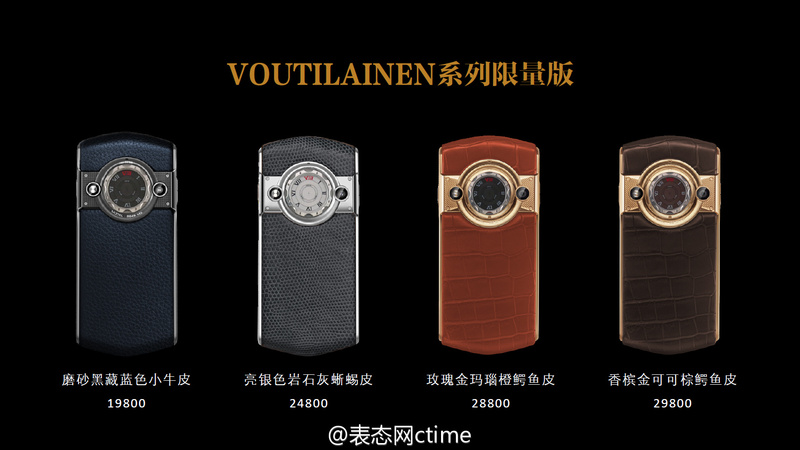 On this occasion, three different ranges of telephones were presented including one designed by the Finnish watchmaker Kari Voutilainen. The M3 range was designed in partnership with the independent watchmaker Kari Voutilainen, whose two phones in the collection are called “Poseidon” and “Athena” for which a limited number of devices have been produced worldwide. The strength of this range is the integration of 6watchmaking within the mobile phone. The special Zodiac range “Year of the Rooster” composed of two distinct versions:1) The Clivia White Diamond version, in navy blue ostrich leather, is decorated with the emblem of the rooster in the shape of a mosaic of 18-carat pink gold and diamonds. This required the use of 21.6 grammes of gold and 39 white cut diamonds. The design is inspired by a painting by Chinese artist, Zhang Daqian. The phone is made of titanium with a polished platinum PVD frame.2) The Ruby Coronet version is decorated on the back of a hand-made rooster made entirely of 18-carat pink gold, inspired by a painting by Xu Beihong. The crest of the rooster is composed of 32 rubies colour flames and its body of 53 white diamonds. The Palace Imperial line of two smartphones was designed by Chinese fashion designer Lawrence Xu. Only 999 units of this edition are available worldwide. The design of Lawrence Hsu is inspired by various elements of popular Chinese artwork, including the royal palace dragon. The back of the phone is elegantly decorated with an 18-carat gold-plated gold dragon, adorned with sapphire crystals. In 2016, 8848 sold 100,000 phones, becoming a leading player in the Chinese telephony industry. “Our latest phones are a perfect illustration of our know-how in the very high technology and Chinese goldsmithing. In the near future, our goal is to combine Eastern and Western cultural elements in our products as we plan to sell our phones to the European market very quickly, “adds Zhou Jia.